Alan Pardew has given what has now become an almost weekly endorsement of Papiss Cisse, whom he believes is ready to get among the goals again. The Senegalese striker has been in chronic form of late, with his last Premier League strike coming in the win over Fulham on April 7. Cisse is unlikely to start against Norwich City today and he has become almost a forgotten man for Newcastle United given how little an impact he’s had on the first-team this season. His only goal has come against Leeds United in the Capital One Cup. Cisse was the one Newcastle player to have a bad week internationally as Senegal failed to qualify for the World Cup, due to Cheick Tiote and the Ivory Coast, but his manager believes that the former goal machine is getting back to where he should be. When asked about Cisse lacking confidence, Pardew said: “You’d have suspected that before this morning’s training session, but he was absolutely brilliant today, our best player on the training ground and that’s really good to see. “His country’s out of the World Cup and he realises the importance of getting back scoring goals for us. He’s a big player for us and we need him in the goals for sure. 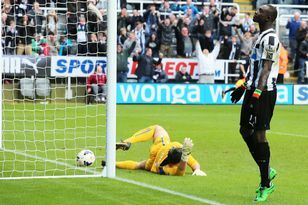 I’ve been really boosted by his personality and performance.” Newcastle are heavy favourites to beat Norwich City today. A win at home to West Ham United took some of the heat off Canaries manager Chris Hughton, who was being talked about as potentially the Premier League’s next managerial casualty. Pardew said: “Anyone in the bottom five can be under pressure but Chris had a great result last weekend. He did what he needed to do at half time, imposed his authority on the team and they responded. “That’s what good managers do and he is a good manager. He did a great job here and I’ll be certain looking forward to seeing him even though we don’t want him to come away with any points so we’ll be making things difficult for him. We had a complacent second-half against Hull which cost us three points that we’ve had to work hard to win back. If we can beat Norwich it would be a really good total for us this season and it’s a great challenge because we’ve got another home game coming up. Unlike Newcastle’s previous two games, Chelsea and Tottenham, the support fully expect to see their team take full points from this afternoon’s opponents. Pardew said: “Yeah, our fans do expect that but that’s any crowd and I think ours is one of the more supportive at a big club towards the players. Of course they will expect us to win against Norwich, but trust me, if we build up a head of steam at any time they play a massive part. There will be a reshuffle in the back four as Mathieu Debuchy serves a ban.